Janice Thompson isn't an author I read often, but whenever I do she always makes me laugh. This book was no different. Here's a small blurb, and we'll chat on the other side! Small-town girl Katie Fisher is planning her wedding. Sure, her boyfriend hasn't managed to pop the question just yet, but that doesn't mean she shouldn't enter a contest in Texas Bridemagazine to win the dress of her dreams, right? But when her boyfriend breaks up with her and takes a job in another town--the very same day Katie wins her dream dress--her world is turned upside down. Should she claim her prize? And will the hunky former pro-basketball player who runs the swanky Dallas bridal shop--yeah, you read that right--catch on to her humiliation if she does? With her typical flair for unique characters, Janice not only fills the primary roles in this book with delightful people, but the secondary roles as well. As I said above, she never ceases to pull laughter from me with her dialogue, and it's one reason I enjoy her books. The premise of this book snagged my interest, but I'll be honest, there were moments I wished Katie would have shared her secret earlier with those at the bridal shop. Each time she tried, something or someone interrupted and towards the middle it felt a bit forced. My only other complaint is that I wish she'd have met Brady a little sooner in the story, but that's because I enjoyed his character so much. Those few minor issues aside, I truly enjoyed this read. 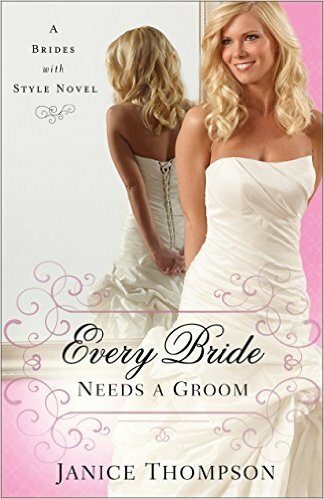 Between Katie's family and Brady's "family" of women who worked at the bridal shop, there was enough characters to enliven each moment on page. Thompson drops them into funny situations and nails their personalities so well that you can picture these people standing beside you. And layering their different stories beneath the main one not only added depth to it, but kept my interest as I wondered how everything would wrap up for each person involved. All together another great book from Janice Thompson. I happily give it 4 out of 5 stars, and you can purchase it here. Thanks for sharing, Susan. I usually find lots to laugh at in Janice's books too!